It is the second novel in a trilogy by Patricia Borlenghi. The first title is Zaira – a girl before her time. The third title is Dorek – deaf and unheard. Zaira, Clarisse and Dorek are all connected in surprising ways. There is a powerful allusion here to one of the fundamental archetypes of the European novel, but with several twists. 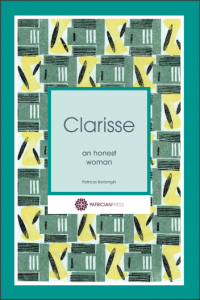 Clarisse might be an “honest woman” (almost) like Richardson’s “redeeming virgin”, but she is Clarisse not Clarissa, indeed “Clarisse in Potignac”. Clarisse might be in Potignac but she is not really French, or really English for that matter. She is in a sense Italian, at least in part. Clarisse’s great-grandmother, whose story she is writing “in the form of a novel”, was of Italian descent. Her name was Raiza, a transparent anagram of Zaira, who is the protagonist of another novel by Patricia Borlenghi. Watch out for this and other refined narrative ruses in a novel which races through like a thriller while engaging with the great issues of life.